Astrill VPN claims to be the best VPN service (novel, right? ), and whether they are or not one thing remains true: they are definitely one of the higher quality VPN services on the market. They have even gone further than many of their competitors by partnering with router manufacturers to include their VPN service in select routers’ code. While they do offer a lot of extra features to increase security, some VPN services include some of the above features in their regular cost. The issue of logging is always a troubling matter for people who truly don’t want anyone to see them online. Other VPN services either claim that they only log for performance purposes or even reserve the right to inspect your traffic if they think you are engaged in illegal activity. While I don’t condone illegal activity, logging and inspection from a VPN company is a huge security concern that leaves many people feeling uncomfortable. But with Astrill VPN, there is fantastic news. They don’t log your data – at all. 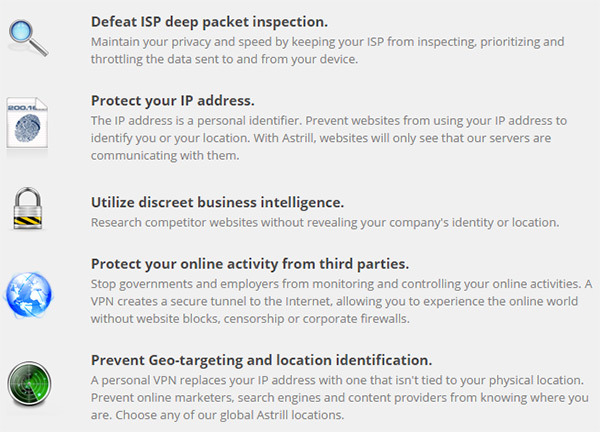 Astrill has done a great job of providing their customers with a ton of VPN connection options. Some of their competitors only offer 1 or 2 technologies to use, but Astrill provides many. You have the choice of L2TP, PPTP, OpenVPN, OpenWeb, SSTP, and even Cisco IPSec. Also, the SSL encryption goes up to 256 bits. As far as the speed is concerned, Astrill delivers. None of the user reviews reported slow or inadequate data transfers when using this service, and as their website says they don’t throttle your connection speed. The only issue that people have reported is that sometimes it can take as long as 1 minute to establish a connection and get the VPN up and running, but this isn’t always the case and may be affected by factors such as latency and geographical location. As far a support is concerned, they’ve got it all! They offer a phone number so you can actually speak with a human being, a ticketing system, an online chat service, a support email address, and a knowledgebase. Though they are an international company, they state very clearly on their website that phone support will only be able to assist you in English. In the end, this is definitely one of the better VPN services. Their prices are reasonable, but maybe a little more costly due to the add-on features. They offer rock star level support and their software is very reliable. If you want a quality VPN, this provider will not disappoint. I have everything nice to say about Astrill. Technical support was very efficient & helpful. Thanks! Astrill is perfect on my notebook and would not change it for any other service. Latest update of Astrill is really great. Astrill is perfectly working fine on my PC as well as my phone after the update. Even their customer support is now much better than ever before. They reply in a couple of hours, sometimes in few minutes. Do try it on your own by using their 7 days trial. I have used Astrill for years and the past 2 years the service and support has taken a dramatic turn for the worse. For several months the service barely worked if at all and contacting support was a revolving wheel of disappointment. I liked Astrill so much that at one point I decided to buy a long term plan with them. I wasted all that money and I couldn’t connect when I really needed to. To really give you an impression of how I feel I had almost a year left on the service and I didn’t even bother to install it again on any of my computers. They are overpriced, have unreliable service, and one of the worst customer service departments I have dealt with in a while. Astrill’s customer service is the most horrible experience I have ever had with any company. They don’t respond for a few days and when they do respond via email, they suggest things that don’t work. After many chaser emails from me, finally they agreed to take a look at my PC remotely. We scheduled a time and then they don’t show up. They treat customers like trash. If you do not wished to be treated that way, don’t subscribe to their product. Look elsewhere.